Social media has become a major player in any marketing strategy. In fact, 90% of marketers say social media is important to their business. And they’re constantly testing channels, content and communication styles to see which tactics and platforms are delivering the best ROI. However, with so many social media platforms and messaging types, tracking your company’s social efforts can quickly become a complex, manual web. Here’s where social media dashboards can help. Social media dashboards are designed to make your life easier, by providing information in such a way that you can absorb it at a glance. They’re also designed to pull together many disparate pieces of data (the ones you may spend hours pulling manually) into summary form. Social media dashboards offer a simple solution to measuring your social media investment from sites such as Facebook and Twitter, giving you a way to quickly answer questions about effectiveness, audience, and engagement. 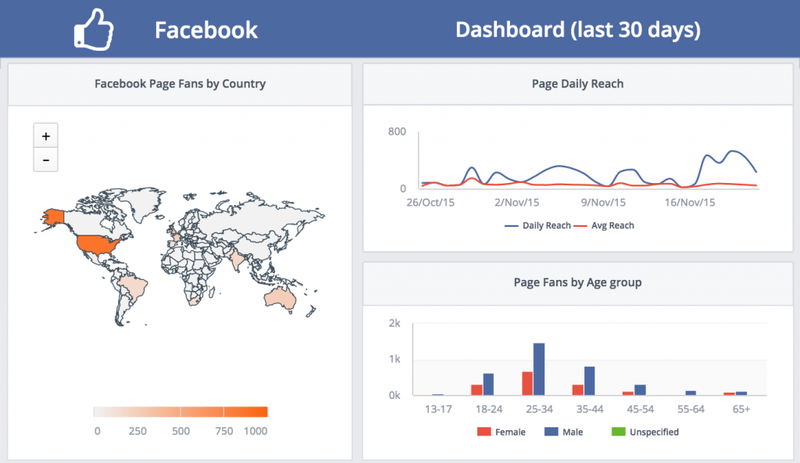 If you’re just getting started with social media dashboards, we recommend these six dashboards. These give you all the nuts and bolts to jumpstart executive-style conversations about the changing landscape in social. Website Traffic Generated by Social Media Channels: Are people landing on your website due to your social media outreach? This metric is crucial in measuring overall engagement, seeing which social posts are leading to clicks and what bounce rate occurs once they hit your website. Twitter Engagement: A Twitter engagement social media dashboard will give you a snapshot view of your tweet volume, as well as the number of shares, likes, and retweets you’ve received. It will also tell you how many times you’ve been favorited and added to lists. Facebook Engagement: Like Twitter, a Facebook engagement dashboard depicts how many followers you have, and the number of times your posts have been shared, liked and commented on. You may also wish to see post views (overall reach) and ad spend. Overall Top Posts: This one is a biggie. What does your audience respond to? Are your followers more engaged in the news-style content, your weekly blogs or fun posts like quizzes and flashbacks? Having an overall view of what resonates on what channel versus the other can inspire you to fine-tune your posts to be more appealing. A top post dashboard would show you the likes, comments, shares, and traffic to the website for your best performers. Post Type Mix by Competitor: You may be following your competitors or keeping loose tabs on them online, but dashboards allow you to be disciplined about how you track them on social. This competitor dashboard tracks posts in four categories: (1) thought leadership or value, (2) promotional, (3) internal and (4) cause-based. You can track their mix over time, allowing you to keep pace with the changes they’re making to their social strategy. Engagement by Competitor: This social media dashboard takes you one step further than just measuring post type by a competitor. Here, you can measure the efficacy of the changes they’re making. For example, you may see 20% more thought leadership posts one month, but see that their engagement rates stay flat. Do You Know Where to Spend Your Time on Social? As social media channels evolve to become more complex, social media dashboards give you the ability to laser-focus your efforts where they count. Additionally, they offer an avenue for justifying your company’s investment in social, and an argument for where to invest more (or less) time. And, easy access to data makes it all possible. To learn more about social media dashboards, visit the ClicData Homepage.